Today is my friend Sadie’s birthday so I thought it would be fitting to show off the purse I bought from her Etsy shop a few weeks ago. Sadie makes unique purses, wallets and earring holders from recycled fabrics and other materials. Have a look! 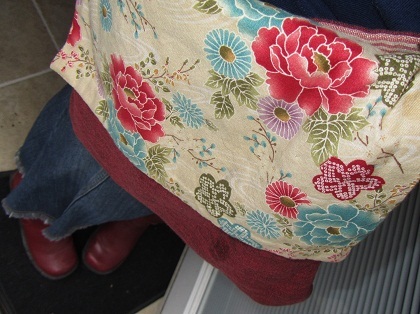 I wore the purse with a denim skirt I’ve had for eons. I don’t wear it often , but whenever I do I get compliments on it. It’s got sort of a fishtail hemline and slightly frayed edges. It’s hard to tell in this picture but the white circle on my jacket is the honey badger button Lynn gave me for my birthday. Lot’s of birthday tie-ins today. 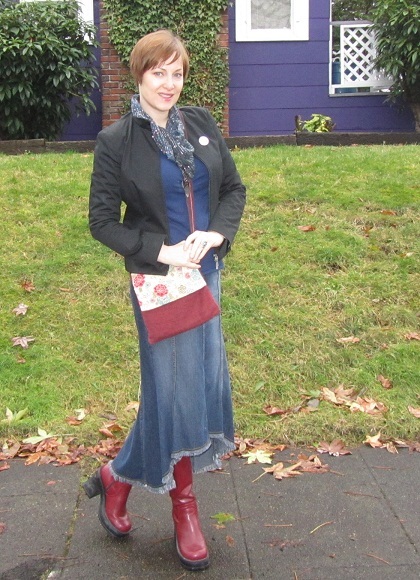 I carried this purse to Seattle’s Ravenna neighborhood. 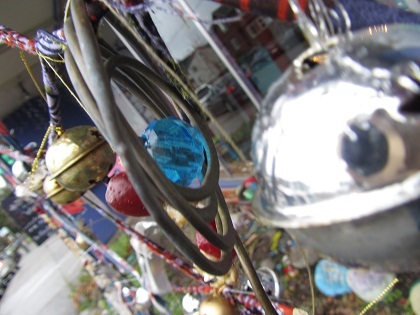 While I was there, I found a neat artistic mobile/windchime/whatchamacalit in a tree. Seattle has a lot of interesting neighborhoods and I like how there’s always a surprise around the corner. I’ll be wishing Sadie a happy birthday when I see her at dinner this evening. Until then, have a great one, Sadie! Thanks Jean!! This put a big smile on my face. I love that skirt – and it’s a super fun outfit all together – and I love that you worked the honey badger into it too 🙂 See you tonight!